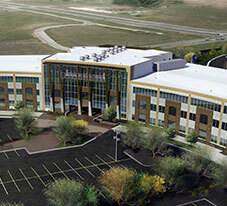 Horizon Point is located at the southwest corner at the intersection of Catron Boulevard and U.S. Highway 16.The facility (including parking lots) occupies more than 30 acres of space. ARC International, a local architecture firm, designed Horizon Point, and Scull Construction Services managed construction of the facility. Employees working at Horizon Point are in corporate service roles, meaning they serve all of our 1.2 million customers across eight states. Practicing environmental stewardship is one of our priorities, so we’ve built Horizon Point to exceed code minimums for energy efficiency by approximately 40 percent. Approximately 500 employees moved into the building in late 2017, but it was built to hold up to 750, with the ability to be expanded with a third wing to accommodate future growth. The interior’s open-concept layout was designed to promote movement and collaboration, fueling discussions, boosting creativity and, ultimately, allowing us to serve our customers more effectively.